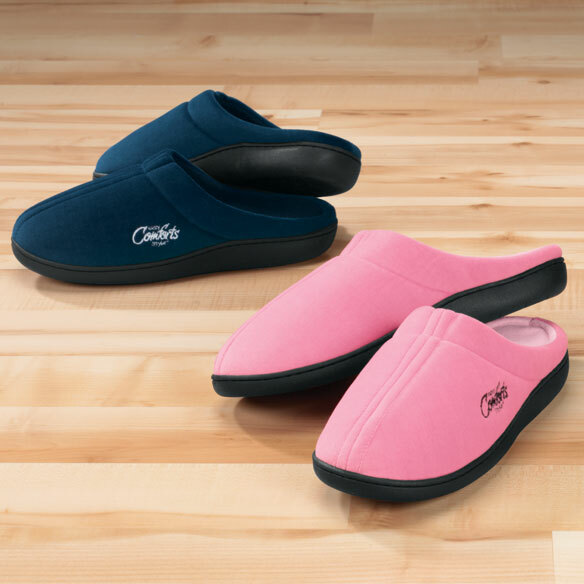 Easy Comforts Style™ memory foam slippers cushion every step in style! These super-comfy memory foam slippers have a removable insole and a non-slip indoor/outdoor outsole. Polyester upper/cotton lining is spot clean. Imported. Memory foam slippers for women and men. They are very comfy!! And great for outside too. These slippers are very well constructed, comfortable to wear and fit just right. I plan to order another pair to keep in my suitcase for travel. Slip on, easy to put on (and do not make me feel like they are trying to come off all the time). Soft yet holding up well with daily use. I'm on my fifth pair of these houseshoes. They don't last forever but are a very good value for the money. They are also the only house shoes I've been able to find that stay on my feet and don't let my ankle twist to the side. But.. I really wish they came in more or other colors. Loved them but ordered the wrong size and did not want to be bothered with returning them. So gave them to someone as birthday gift. I'm looking forward to seeing them in more colors. I bought two pairs of these slippers because they are perfect for what I need them for: I have an artificial leg and the design of these slippers allows me to use them one at a time. Even though I have only the use of my left leg, I can still use the right slipper on my left foot, allowing me twice the use of my slippers. I gave the other pair to my daughter. They are so comfortable and cushiony. Very comfy, wear them all day at home. These are so comfortable that I am wearing them every day around the house.Besides comfort they are warm. they were a gift, for Christmas, and my grandson really loved them. They felt so soft and good. I purchased these slipper for my Mother, and she loves them. For a senior they are just right because they encase the foot nicely and look very stylish. No toes hanging over the front of the slipper as they shuffle along. PERFECT. wears good for about 5 months, then loses all support, but i still like them for the money spent.wish they lasted longer. I would have to say that these slippers, are the most comfortable slippers I've ever had!...,They are so soft, when walking in them, its like walking on a cloud. wear these everyday. they are soft and easy to wear.there is nothing bad about these slippers. Indoor outdoor I love them. I need an extra pair. Don't know if enter sole can be washed? They get sweaty and sticky. shoes are very comfortable at first. but after wearing them for awhile, they lose their support. to me it`s like the gel or support gives out way to soon, but i will continue to order as i find out they are the best for my feet. I wear a size 8 in shoes, so I ordered the medium. They are at least 2 inches too long at the heel, and would get even bigger as the foam gets compacted from wearing. I feel like a little kid walking around in Mom's big shoes. Although the quality is very nice, the sizing is terrible. Order a smaller size if you want to get close to what you need. These slippers are comfortable, with a soft, squishy feel. Only trouble is that the small is about an inch too large for my size 6 feet. I can keep them on, but a little shorter would be less clumsy. I bought these to wear in the house for my Moma,she said they are comfortable,but they slip on her feet.The size it says in the book is 7-9 ,but she can't keep them on her feet due to they are to big. these slippers are good looking and comfortable. The only issue I have is they are a little to large. I ordered based on the shoe size listed, but I should have bought a smaller size. As long as I have heavy socks on, they are ok. These are nice slipppers (very soft and comfortable). I wear a woman's size 6 and I purchased a small and they run big. I like these slippers a lot. The only thing is the cushiony-ness goes flat after walking in them for a period of time. It's supposed to be memory foam, so I guess it does conform to the shape of the foot, and maybe that's what is supposed to happen, although I thought it would feel cushiony for a bit longer. I don't like small, medium, and large as sizes. I ordered medium and they are a little too long. I wear a size 7 not 7 1/2. Thanks anyway. I thought my size was medium but the medium pink was too big for me but fit my husband. Decided to order a pink small for me and a medium blue for my husband. When the medium blue came, that was too small for my husband and too big for me; the small pink was OK for me. Ended up sending back medium blue and keeping the two pinks - now we both have pink slippers that fit. So, the bottom line is two pairs of slippers, both medium, may not fit the same. Once we got the sizes right, they are great slippers. I am a diabetic and cannot stand tight or snug shoes. These slippers are a big too wide, but not where they fall off. I wear them every day. Great to wear when lounging around. Pink seems to be more durable. I have small washer, they have wasted great every time. I wear over Unna boots and drainage from legs is excessive, still they are durable. Blue -were great 'til put in washer. Insole fell out and shredded in tiny pieces. Still I will order more, maybe just pink. Can these slippers be washed? Comfortable - need to know if they can be laundered.. True to size feels great and price is right, i will order more and told my friends about them i really like them. The way the shoe has to b sized,with no half. sizes,its just too big. The insoles are like clouds when you wear them the 1st time..After that they are flat pancakes..
cant wear them as they tip back and hurt my legs and are to big. and I got the small. Liked them the first week,after that they are just awful. They are all atretched out,the memory foam inserts are completely flat. The chemical smell was so bad I had to send them back. On top of that I had to spend half the price of the slippers to send them back. Not happy! I sent away for a size 8w memor4y foam slipper and got a size 10. Not very happy, would not order again. I would like to try them out. comfortable and i can wear them outside. My mother bought a pair and loves them. I thought I would try them also. I bought them before. They are very comfortable. i read the reviews, it was a good price also. I like the price and I need a pair of slippers that I can wear outside. Reviews is good👍.. I like the style. I have plantar fasciitis, need orthotics to fit inside. These slippers are easy to fit and are very comfortable. Because they sound comfortable, though I have ordered them before Christmas and never got them. My husband ordered a pair. Sale price half of original costs!! Says it is supposed to be comfortable. I have many foot problems, and so I hope they are. I was given a pair for Christmas and I love them. They are very comfortable as I have nephropathy. I wish they came in black as well, I would order another pair! I hadordered a pair earlier and liked the way they fit. Liked the rubber sole on these if I need to step outside. I needed some new slippers. Comfort for my mom and I.
I keep buying this same shoe because it works for me. I have been very happy with these slippers. I can't even tell you how many I've ordered. The number should be closing in on 100 I would think because I always order 4 pair at a time. 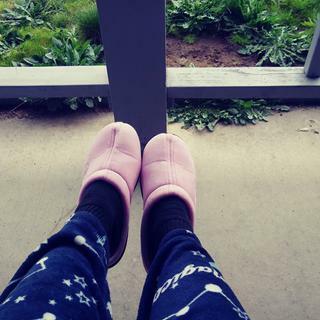 Love the slippers they are so comfey on tired aching feet. I have been wearing them for years and will continue to do so. The prices here are the best I've found . my sister wanted some pink slippers in this style. They look comfortable and easy to put on and off. I've been buying these slippers for years. They are nice to come home to. I'm very satisfied. These slippers are perfect for people with edema in their feet. I love them! Is the medium for size 6-7? will these fit a wide width foot? Does the largest size cover size 11? What size does women's large slippers cover?Is it size 9 thru 10 ? BEST ANSWER: Thank you for your question. 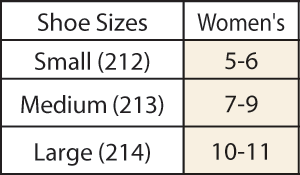 The large size slipper is for women wearing shoe sizes 10-11. We hope this information will be of help to you. BEST ANSWER: Thank you for your question. No these slippers are spot clean only. We hope this information will be of help to you. BEST ANSWER: Thank you for your question. The small size is recommended for shoe sizes 5-6. We hope this information will be of help to you. what size is a mans 10 1/12 wide foot? BEST ANSWER: Thank you for your question. This item is only sold in women's sizes. The large would fit a women's shoe size 10-11. We hope this information will be of help to you. whats the largest size cover ? I need sleeper with a heel at least 1 inch high. How high is the heel of the Memory Foam sleepers? BEST ANSWER: Thank you for your question. While the sole of the shoe measures 1” high the inside memory foam is only approximately 3/16”. We hope this information will be of help to you. These slippers do not have an inch high for the heel, only half an inch. will the large fit a mans 4 e wide foot ? I don't think so. I wear a sz 9 wide shoe and these slippers are almost not wide enough. They're only moderately comfortable. BEST ANSWER: Thank you for your question. For half sizes order one size up. We hope this information will be of help to you. do you sell replaceable insoles? BEST ANSWER: Thank you for your question. Unfortunately we do not sell insoles. We apologize for any inconvenience. WHAT ARE SIZES IN MEN? BEST ANSWER: Thank you for your question. The small will fit a men's 3 1/2 to 4 1/2, the medium will fit a men's 5 1/2 to 7 1/2 and the Large will fit 8 1/2 to 9 1/2. The slippers do run on the larger size. We hope this information will be of help to you. BEST ANSWER: Thank you for your question. If the slippers need to be wash, we suggest to wash them by hand as they are not made for machine wash. We hope this information will be of help to you. Where are these slippers made? BEST ANSWER: Thank you for your question. These are made in China. We hope this information will be of help to you.